We are expecting a strong cold front to be here tomorrow and last for several days. We did a load of laundry today. There’s a fine line between having wind to dry the clothes vs wind that may blow them away. It can cause too much stress on the clothes pins. 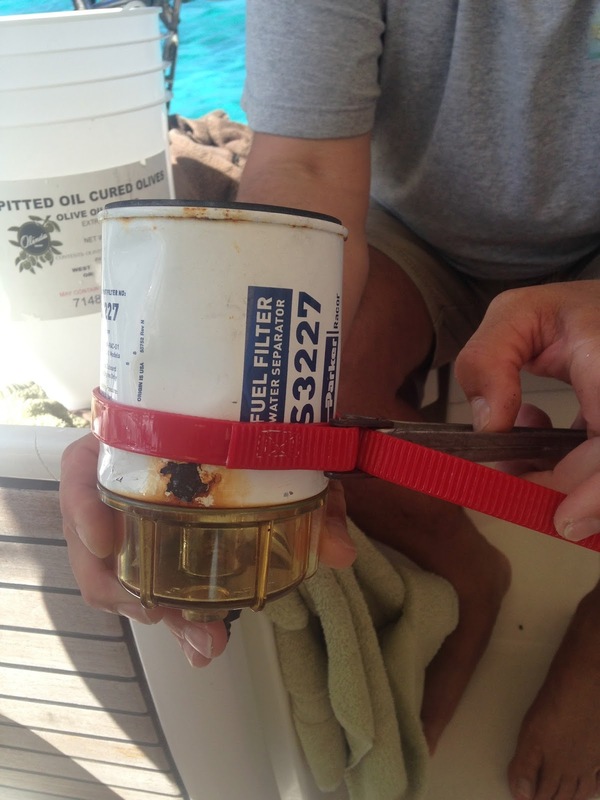 Dave changed the Racor gas filter for our outboard motor. It has kept our troubles with fuel to ZERO. It traps water and who knows what else that can be in the fuel. There is a filter attached to a drain bowl that is attached to a mount that is fixed in the dinghy. It was still working fine, but the filter was starting to rust. If that had rusted through, it would have siphoned the 5 gallon fuel tank of gas right into our dingy. Dave was having a hard time separating the metal filter from the hard plastic drain bowl. It’s been in place for almost 2 years. He was hesitant to put a tool on the plastic, so he used a strap wrench on the filter. We tried to superman it off with my help. I even suggested using silicone hot pads for grip. But he ended up having to use a channel lock pliers on the plastic bowl without cracking it. SUCCESS! Here is another example of a 20 minute job taking 90 minutes. Next Dave emptied 2 jerry cans of diesel into our fuel tank. He took those cans into town to be filled, along with a 2.5 can of gas. After those jobs, and finishing the laundry, we rewarded ourselves with dinner on shore. We returned to Rowdy Boys from about 2 weeks ago. It was about 5:00 when we arrived. We like to get back to the boat around sunset, which is shortly after 6:00. Before we ordered, they told us there would be a buffet pig roast tonight starting at 6:30. It sounded tempting, and a fun way to mix with the locals, but we didn’t want to be on shore that late. Before we left, a guitarist had arrived and was warming up. I bet it ended up being a fun night for everyone.